WHO ... For anyone who needs a little lift What Makes hair big yet soft and touchable Plumps the hair shaft to add volume and thickness Provides heat protection and helps repair and strengthen hair Formulated without parabens or sodium chloride. Color and keratin treatment safe. UV protection for hair. WHY...Oribe Signature Complex (Watermelon, Lychee and Edelweiss Flower Extracts) defends hair from oxidative stress, photoaging and the deterioration of natural keratin, all while protecting from the drying, damaging and color-depleting effects of the elements. Panthenol swells the hair shaft and volumizes the hair. Sunflower Seed Oil, Glycerin and Vitamin E moisturize and condition hair, leaving it hydrated and full of volume. Hydrolyzed Wheat Protein conditions and renews damaged hair, while adding body, shine and thermal protection. Superior Styling Polymer provides long-lasting, flexible hold and memory. 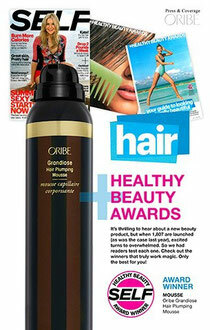 Structure-forming Starch Polymer thickens and adds hold while smoothing and conditioning hair. I go to see every day some websites and information sites to read articles or reviews, however this weblog presents feature based articles. Good day very nice web site!! Man .. Beautiful .. Amazing .. I will bookmark your website and take the feeds also? I am happy to search out a lot of helpful information right here in the post, we want work out extra techniques in this regard, thanks for sharing. . . . . .